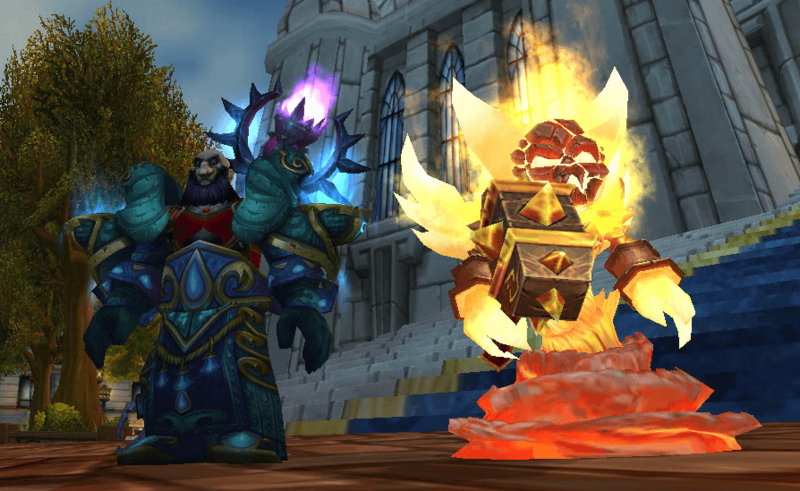 Ten Years of World of Warcraft. OMG! I started playing World of Warcraft when it was still in beta 10 years ago. Until the end of Cataclysm, I maintained a pretty steady subscription to the game. It was only after I killed Deathwing that I decided the game was no longer as fun for me anymore. But with the 10th anniversary right around the corner and Warlords of Draenor, the newest expansion coming out tonight at midnight PST, I’ve renewed my subscription so that I can take Lesserheal, my little Dwarf Priest, out for a long-overdue stroll through the Dark Portal once again. Now, I’m not a spring chicken anymore, and I can’t do an all-nighters that keeps me awake and playing an MMO through the wee-hours of the night. So the 2am launch (central time, for me) is out of the question. I am, however, setting my alarm for a couple hours earlier so I can at least get through the introductory quests and see what I can see before I have to go to work. Over the past ten years, I’ve changed a lot as a person. Both physically and emotionally. I don’t spend hours and hours on video games anymore, but that doesn’t mean I don’t want to. One reason I don’t is because of the toll the sedentary lifestyle took on my health (remember, I used to weigh 310 lbs.). Today, I have a FitDesk–basically a stationary bike with a desk made attached to it–set up directly in front of my gaming PC (review coming soon, I promise!). As soon as I log into Azeroth for the new expansion, I’ll also be pedaling away and getting in a bit of exercise. It’s not the same as running, sure, but it’s better than sitting without moving at all for hours on end. Part of the reason I left World of Warcraft is because of how the game’s changed. Or rather, how it hasn’t. At its core, WoW is still the same game it was in 2004. It’s flashier and more accessible, but it’s themepark MMO center is still the same. And after doing anything for ten years, even if it’s awesome, people tend to get bored. Especially me. However, nostalgia is incredibly strong, and I’m ridiculously sentimental. I made a lot of friends playing the game, many of whom I am still in contact with. I had a lot of good times. Watching the new documentary Looking for Group the other day really made me want to relive some of those old glory days of raiding and exploring. With Warlords of Draenor, Blizzard knew exactly where to hit me to get me to resubscribe and buy their new expansion. Not only are they giving The Burning Crusade (my personal favorite expansion) a time-travel once-over so that I can return to a familiar locale with all the improvements and lessons learned over the past decade (from both Blizzard and myself), they are also doing a limited-time redesign of the very first MMO raid I ever experienced, Molten Core. Gaming hasn’t been a priority of mine in a long time. I love it, and I miss it, and I think WoD is going to help me get back into casually enjoying a lifelong hobby. Part of the reason is that I have so little free time that I need to spend it not sitting in one spot. The FitDesk helps with that. Another part is that I have other projects to work on (books to write and edit, blogs to post, hopefully soon podcasts or YouTube videos to record), and those have to take priority over slinging spells. But gaming to me is also about the community, and I love MMOs for the social outlet I get there. Very few of my friends play World of Warcraft anymore. I miss that. Most of my IRL friends are playing Final Fantasy XIV, and I doubt they’ll be coming to Draenor with me. Which is where you guys come in! Play with me! If you ever want a healy dwarf in your party, add my Battletag to your friend list. I’m Lesser#1993 on Battle.net. (Just be sure to comment or tweet me or something to let me know you’re not just a spammer so I’ll accept the friend request). So yeah, if you can’t tell, I’m a little excited that the new WoW expansion comes out tonight. I won’t (can’t?) let the game take over my life like it has in the past, but I sure do look forward to melting a few faces and killing a few orcs. At least for a month or two. This post makes me miss WoW …. a little! Not sure I’d ever be back but there are definitely times that I miss the game. I love the idea of the fit desk too. Can’t wait to read your review of it! Enjoy Azeroth again! I miss the idea of the game more than anything, so I hope quick jaunts can help alleviate that. Long time, no talk to, my friend! You know, I’ve looked into buying a FitDesk, but, GEEZ, are the expensive! 🙁 And, joining in a gym in Korea is an expensive investment, as well- upwards of $280 for just 3 months (and that’s bare-bones). The problem for me is the boredom I experience when working out, which is the reason I wanted to get the FitDesk, but I couldn’t justify the cost in our small apartment (well, actually it was the almost $300 pricetag- a fourth of the cost for a flight home and back from South Korea). But, with us moving to Japan next year, and our HOPEFULLY larger home, it IS something I’m considering (although, I’ve considered the Treadmill Desk- something we DEFINITELY can’t afford- those ARE the price of a roundtrip ticket back to Alabama). Well, the first thing I’d say is that if you’re bored by “working out,” then you’re doing the wrong exercises. There is simply no reason to do anything you’re bored by because you won’t keep it up regardless of how good it is for you. That’s why I run–I like it. I hate lifting weights and typical gym stuff, so I focus my energies elsewhere. As for the FitDesk, I think it’s worth every penny. It’s small and compact, and it lets me keep active when I’m just working and doing goofball stuff. It really helped me keep my Thanksgiving weight under control when I wasn’t running as much as I should have been. In terms of the treadmill desk, I’d like one, but I think the FitDesk is a little better fit because it’s much easier to get work done with it. While i’ve never done a treadmill desk, the “just sitting there” nature of it means that it’s much easier to just hop on and do a little here and there instead of making so much of an ordeal like getting on a treadmill tends to be. At least, that’s how I see it. I have a treadmill, too, and while I don’t use it for working, I tend to find it much easier to hop on the FitDesk than get on it for a quick walk. If you do decide to go for it, I think I have a $30 coupon code for the FitDesk around, which makes it a little more affordable.